A Fabulous English Farmhouse - Where!? 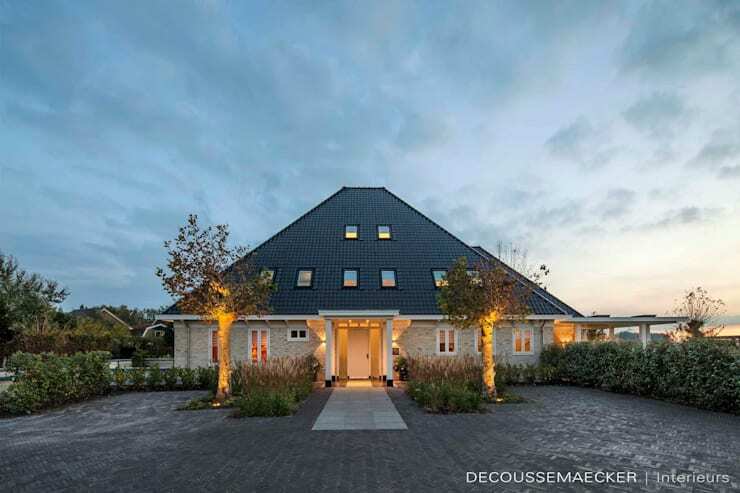 Decoussemaecker Interiors has furnished and decorated a very interesting home in Holland that we will get to explore today. The type of property we see here is in the style of conventional English farmhouses, usually found in the British countryside, and traditionally utilised by Frisian farmers. The structure consists of a bold square for the main body of the house, with a pyramidal roof, flattened at the top. We are quite sure you would agree that the structure has a very charming aesthetic about it, with the quaint structure reminiscent of country days gone by, and luxurious interiors, which we will be acquainted with a bit later on. We also find that the Dutch creators of this project have combined these varying styles with care, adding their own personal touch. Our first view of the home renders the house in a mystical light. This is achieved by several aspects. Firstly, the strategic lighting on bot the house's façade and the trees in front of it, lends a gentle and reverent glow to the composition. Secondly, the shape of the building is reminiscent of a pyramid structure. Pyramids, of course, has religious or sacred value in a number of cultures, including Egyptian and Mayan. It is difficult to deny that this image conveys a captivating atmosphere around the home. In the entryway of the home, we see quite a different side than that of the humble and devoted exterior. A brilliant white space greets us upon entrance, and it must be a spectacular sight to all who beholds it. The white walls, ceiling, floor - white everything!—creates a space that is ever-expanding and full of possibilities. The grand staircase is arched, but is completely visible from the first floor, since the landing does not divide this space vertically. In this manner, we get to see the entire staircase as a whole, and get a true sense of its character. 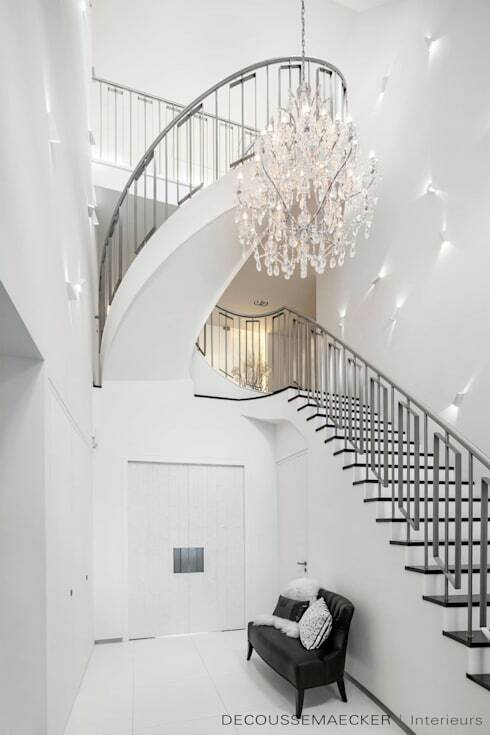 The dark wooden treads and the ornately simple banister creates a look of sophistication against the white backdrop. The true star of this picture is lighting, and no-one can deny that it creates a spectacular effect. The crystal chandelier captures our attention first, of course, and duly so. This is a remarkable centre piece, and its elegance cannot be understated. In addition, we see lighting fixtures on the wall next to the staircase. These lights look like whimsical feathers, or the fibres of a dandelion blowing in the wind. Not only is it light and lovely, but it also adds a sense of dynamism to the area. In the dining room, we get to see another aspect of traditional British home: a regal air. The grand, extended dining table with sophisticated decoration and accessories renders this room supremely elegant. The long, narrow dining table is made out of marble—a material that can't go wrong when it comes to sophistication. The accompanying chairs of the dining room are simple in a minimalist style to resonate with modern trends. On the other hand, the partitions on either side of the dining table area are coated in rustic stone tiles, each side with a gas fireplace, ensuring that the homely farmhouse atmosphere is not lost. Once again we see a beautiful crystal chandelier above the table, not only adding even more sophistication, but also creating continuity with the decoration of the rest of the home. On the other side of one of the rustic, fireplace included wall partitions we saw on either side of the dining room, we find a living room area. From this vantage point, we get a better idea of the eclectic style of the home to which we have alluded to before. Against the backdrop of rustic stone and fire, we see distinctly modern elements in the living room area itself. It is a marriage of styles that seems to work very well. Geometric, simplified volumes are found everywhere, and the colour palette is kept neutral. The space is equipped with contemporary electronics, but also provides utmost comfort for family or relaxation time. Contrary to the eclectic living room and dining room, the kitchen only hosts the modern style. 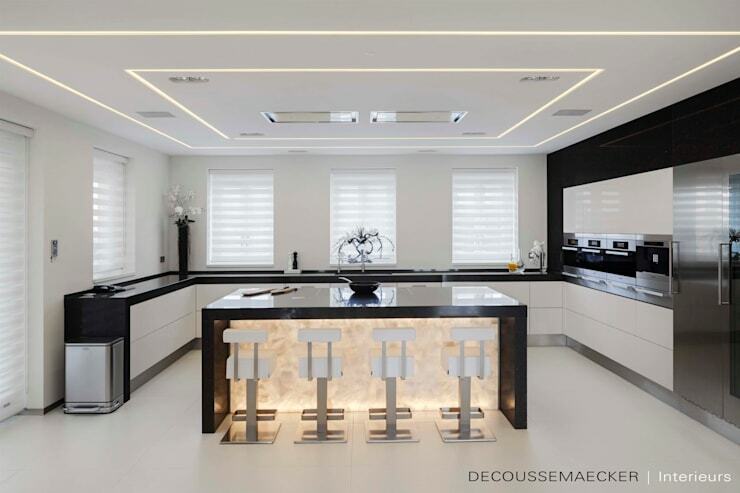 The entire kitchen is furnished and decorated in contemporary design of a black and white colour scheme and a minimal aesthetic. The appliance and storage capacity of the kitchen are streamlined into one continues design, offering optimum use of space and ease of access to the necessary equipment. This also frees up an abundance of counter-top space to function as task areas. The kitchen island is accompanied by bar stools at which the family can have breakfast or chat to the chef. This area is lighted, and the white material used for it looks ephemeral, adding a beautiful visual area to the room. We end off our tour today with the main bathroom. 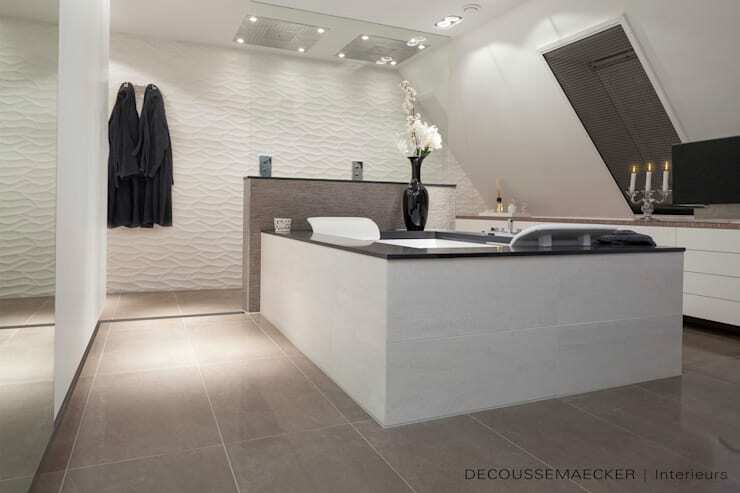 This beautiful, modern bathroom has the appearance of space, with its modern finishes and luxurious features. The main feature of the room is the very large bathtub at the centre. The dimensions of this tub allows for total immersion in waters, ensuring the most relaxing of experiences. The tub also has headrests on either side, providing comfort for the bather or bathers! What do you think, wouldn't you like to have a bathroom like a proper spa? For more bathroom bliss, take a look at these brilliant bathroom trends!